Hello storm, you’re wild and angry, violent and reckless and I don’t seem to like you! I’m nothing like ready for cold obviously; a powerful storm with violent winds and heavy hail and rainfall is ripping through Lebanon leaving me with limited desire to step out. So it was almost lunchtime and I still haven’t decided on what to cook! I went roaming in the kitchen when my sight fell on potatoes. Since I didn’t have enough of gold potatoes to make a large dish of gratin enough for guests and us, I added sweet potatoes! Results were gorgeous and crunchy. Yummm! I have decided to eat more vegetarian food during January and I proudly add this recipe to my meat-free repertoire. I added a dash of curry to it while the cream was simmering and some parmesan cheese on the top before baking, that I don’t mention in below recipe, but now that I reveal it you may want to try it with curry or even chili for some spicy flavor. Pre-heat the oven to 200°C/400°F/gas 6. Butter a shallow ceramic baking dish. Pour the cream in a large saucepan, add salt, pepper, nutmeg and heat to boiling over medium-high heat. Add potatoes and drizzle with olive oil and let simmer for 3-4 minutes. Remove pan from the heat. 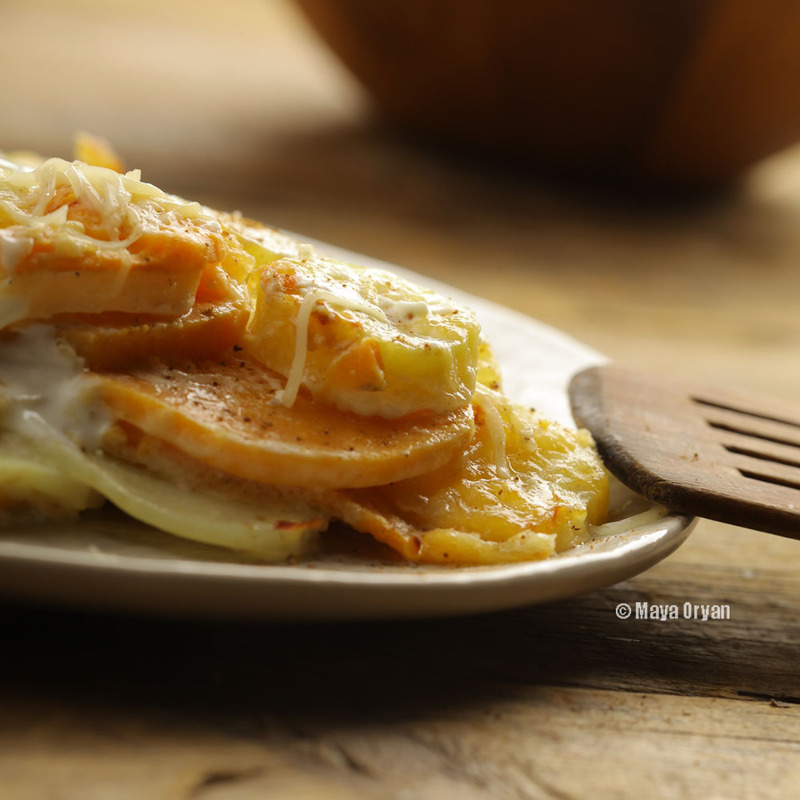 Use a slotted spoon to transfer half of the potatoes, layer them and sprinkle with cheddar cheese. Top with the remaining potatoes; pour the cream mixture and sprinkle with the Emmenthal cheese. Bake for 40-45 minutes until gorgeous and golden on the top. Mornings are the worst when one is sick. I still have the cold and waking up in the morning with a persistent cough and a very dry throat. My beloved husband came to bed this morning, with some freshly squeezed OJ and told me: “I cooked Makhlouta for the kids and you”. I guessed he was cooking Makhlouta as I heard the pressure cooker whistling;-) It’s still awesome news, no! He knew I was too sick to enter the kitchen. How sweet of him! I love how he didn’t say lunch or dinner, he said Makhlouta his favorite meal -and mine- on a cold winter day like today. 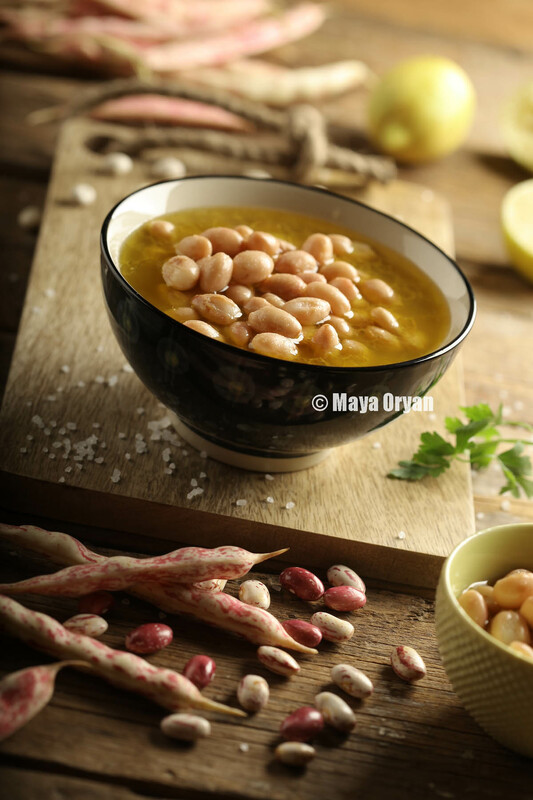 Makhlouta is a Lebanese traditional stew that means “mixed” because it consists of a mixture of pulses and beans. There’s no straight recipe, it can be any kind of 5 to 7 pulses and grains. Open your kitchen cabinet or check your pantry and take a handful of every grain you have there. I grew in the heart of the city and my parents never cooked Makhlouta for us, while my husband grew in a Lebanese village called Baskinta situated at an altitude of 1250 meters above sea level. The winter in Baskinta is cold and snowy, so many dishes are pulses based and Makhlouta is a meal you can eat twice a week. Now that we are married, anytime I ask him what to cook, his answer would be anything with whole grains. 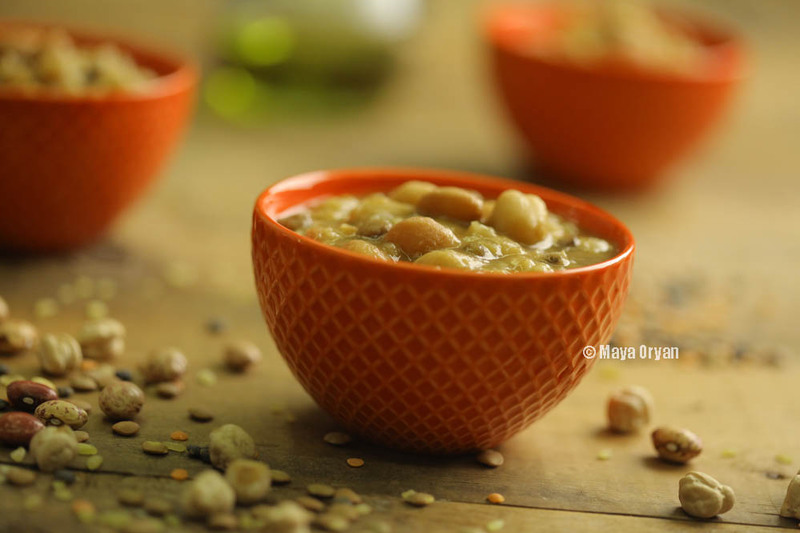 Makhlouta is loaded with fibers and protein, its simple ingredients makes of it a very easy vegetarian thick soup. This recipe uses pinto beans, garbanzo beans, lentils, whole wheat, brown rice and cracked wheat but feel free to use any 5 to 6 variety of your choice like broad beans, white beans, red kidney bean. The most common is to use brown lentils, but this recipe uses a mix of 3 colors lentils as we had an organic mix in our pantry. NOT ONLY HE COOKED FOR ME, BUT HE ALSO TOOK THIS BEAUTIFUL, MOUTH-WATERING PHOTO! SERGE YOU’RE A TREASURE! Drain and rinse the beans and the chickpeas. Place it in a pressure cook, cover with water and let cook. In a separate pan, heat the oil and fry the onion until wilt and brown. Add lentils, rice, burghul, whole wheat and water and bring to a boil. Add the cooked beans and chickpeas, with their water, stir in tomato paste. Season with salt, and cumin if desired, and simmer until everything is tender. 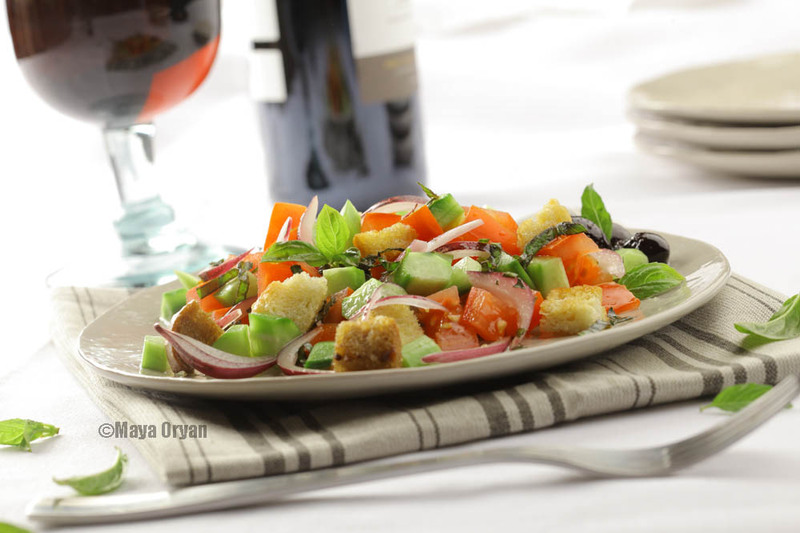 Before serving, drizzle with olive oil and enjoy. Tip 1: If you’re not using a pressure cook, place the beans in a saucepan, cover with cold water, bring to the boil and simmer. Let it cook until tender; this might take a little over an hour, depends on how fresh are the dried beans. Tip 2: While soaking the beans, you may rinse and change the water after a couple of hours, if you want. Use a lot of water as the beans will grow in size and volume. Dubai is calling me again and I have to travel next weekend. My trips are getting closer with time and I’m kind of used to it now, it’s in the system! It’s actually in the entire family’s system (laughing). My mom offers her baby-sitting services before she accepts any invitation from her friends. My husband waits until I come back to travel so we don’t both leave the kids at the same time. My sisters cook always a little bit more to send it to us and my daughters have always a wish list of gifts ready for me to get them when I travel. I’m so blessed! Thank you all for your support and for understanding how much I love what I do. Well, everybody knows that when I’m not styling food, I’m still very busy doing everything else. I’m much more productive than every woman I know who has no job. I don’t know if it’s my energy that keeps me on the go, or simply the guilt feeling that I’ve been away from my family to work and I have to make it up for them. I exercise every day. I cook two meals (stirring in one hand and whatsApp-ing with the other). I tend to be the perfect wife, the fit mom, the present friend and the career woman. My friend says it’s my adrenaline, I simply think I’m well organized. It requires nothing but good planning (and love life). I don’t want one day to look back and realize that I wasted my life only dreaming. 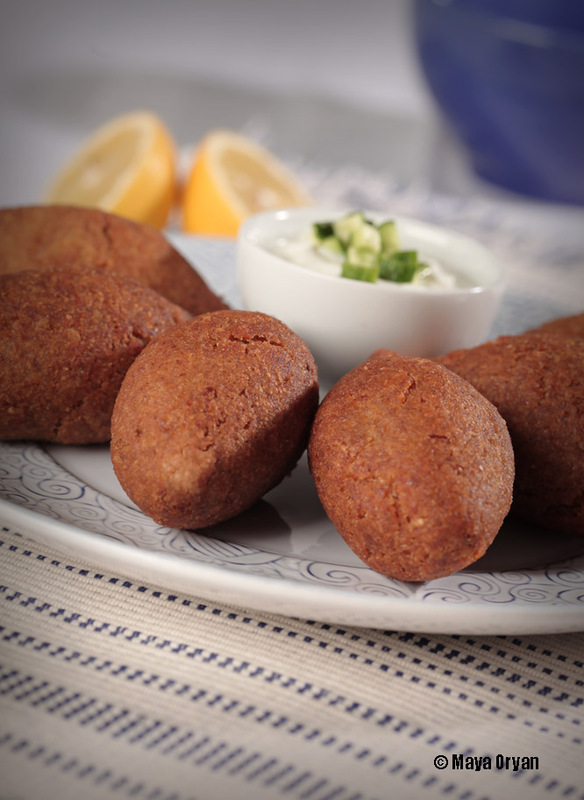 Pumpkin kibbeh balls are more popular during Lent and among vegetarians. For those of you who’d like to adventure in the kitchen, making this recipe, it’s somehow long but worth every effort. ½ kg fresh pumpkin, boiled, pureed and drained in a sieve for 10 hours. In a heavy-bottomed saucepan, sauté the onion until brown and soft. Add Swiss chard, chickpeas, walnut and pine nuts and fry. Turn off the heat, add seasoning, lemon juice and set aside. Process onion, pumpkin purée and bulgur wheat. Add seasoning and flour, mix and let it cool in the fridge for at least 1 hour. If mixture is too hard add few drops of water. Moisten your hands and form kibbeh mixture into egg-size balls. With your index finger, make a hole on one end of the oval ball and spoon one tablespoon of filling inside and pinch the end to seal. Fry the kibbeh in cooking oil in batches or if desired, roast it in oven for about 25mn. Place the kibbeh on a serving dish and serve with cucumber yogurt salad.